All the Horror fans around the world have seen this film for sure and one of the most memorable scenes of the film was of a ‘Spider Walk’ by the possessed girl. 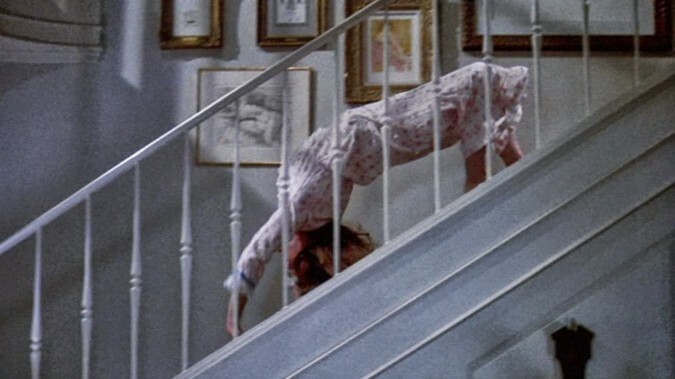 The possessed girl Regan (Linda Blair) descends the staircase walking like a spider with her face upside. In 1973, when computer imaginary was not invented shooting a scene like this was very tough. Director William Friedkin hired a contortionist (generally used in a circus back in the day) Ms. Linda R. Hager. A harness was used to provide the effect with wires hung above Linda on the staircase at the set. Linda would advise the director when she would be touching the floor by her hands and feet and then she would be brought down the staircase by the harness and the floating wires. Before the release of the film in December’1973, the director deleted the clip from the movie as he thought it was too much of an effect, which comes very early in the film. Although another important reason to remove the scene was the visible wires in the scene, technically there being no way of erasing the wires from the scene at the time though screenwriter William Peter Blatty was unhappy with the removal of the scene. However after 30 years of its release, William Friedkin added this scene in the year 2000 version of the film after removing the wires through CGI effect. The Exorcist was the first Horror film in the history to be nominated in the best picture category of the Academy Awards. The film was nominated for 10 Academy Awards in total and won two in the category of best-adapted screenplay and sound mixing.